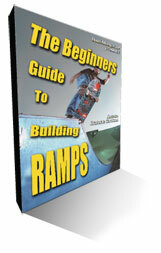 The Beginner's Guide to Building Ramps contains 54 pages full of money and time saving tips along with simple step by step instructions on every aspect of building a ramp from start to finish. You will find tons of helpful ramp building photos, easy to understand full color illustrations, and over 18 years of ramp building knowledge packed inside. Also included is a complete materials pricing worksheet.